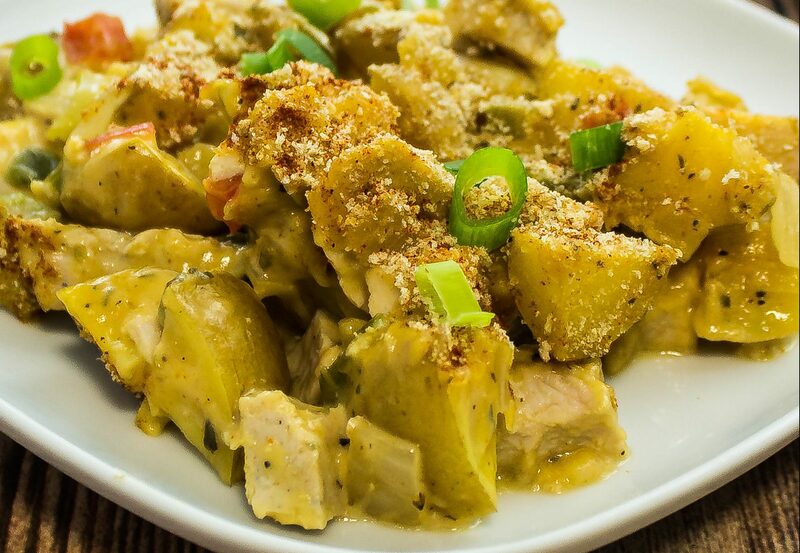 Cajun Turkey Potato Casserole is roasted turkey breast & baby potatoes mixed with Cajun spices, vegetables, & cheese. Weight Watchers friendly recipe- 5 SmartPoints! I am a huge casserole fan. No two casseroles are the same… A random mix of ingredients, usually with the addition of cheese, baked and able to feed a crowd, or a household of two, for days. My latest casserole creation is a favorite in my house hold. 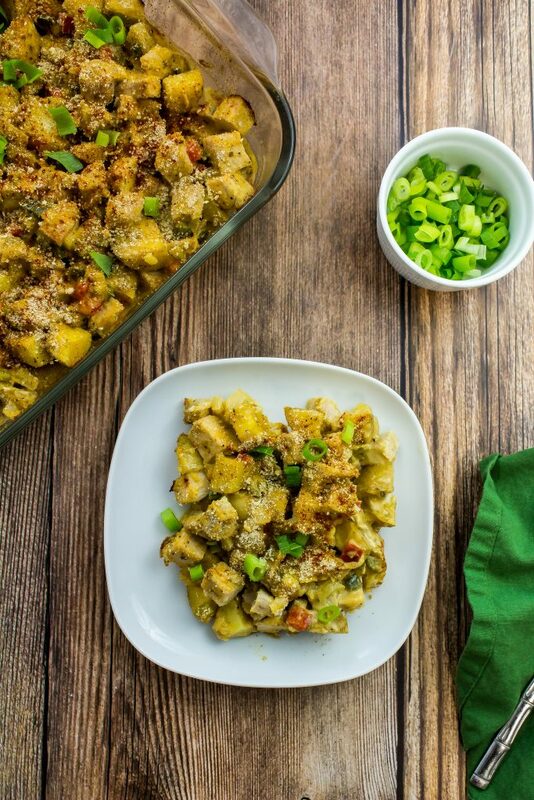 My Cajun Turkey Potato Casserole is a delicious blend of roasted potatoes, Cajun spices, and cheese sauce. Roasted turkey breast and baby potatoes mixed with Cajun spices, vegetables, and cheese baked until bubbly. This is a Weight Watchers friendly recipe and each serving is 5 SmartPoints. I love to brainstorm for new recipes and casseroles are one of my favorite dishes to experiment on. Casseroles are a beautiful thing… a mixture of different vegetables, protein, spices, and typically cheese. What’s not to love?! With a casserole, you can mix ingredients together that you wouldn’t typically think go together, but totally work. Plus, casseroles are great to make during a busy week so you can have leftovers! One of my favorite casseroles growing up was my mom’s chicken casserole. Layers of shredded chicken, hash browns, cream of mushroom, and cheese baked to bubbly perfection. 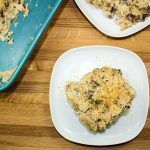 I have yet to try and make a Weight Watcher friendly version of this beloved casserole, but I plan to try soon. A while back, I was thinking fondly of this casserole and decided I needed to make a casserole with potatoes. Potatoes are probably my favorite vegetable, and the perfect ingredient in any casserole. After a few experiments, my Cajun Turkey Potato Casserole was born. Lately, I’ve been cooking a lot with turkey breast tenderloin. 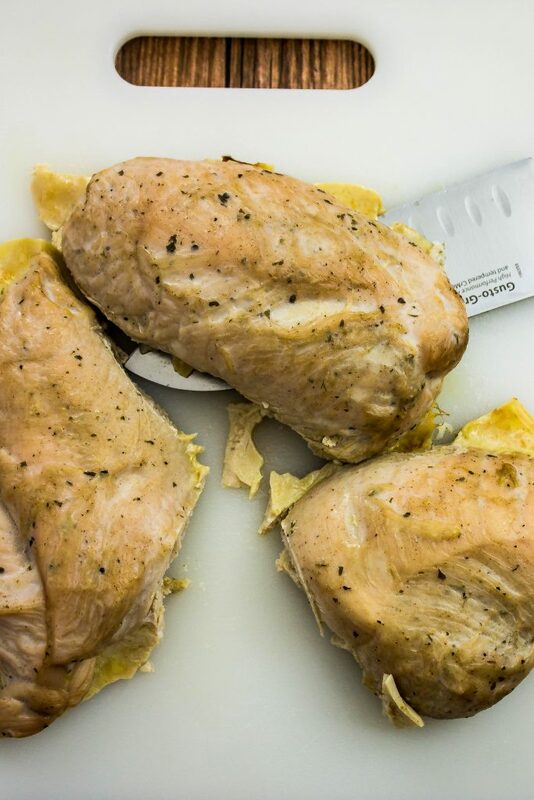 Have you ever tried cooking with turkey breast as opposed to chicken breast? I love chicken, but sometimes want something a bit different, and turkey breast is the perfect option. 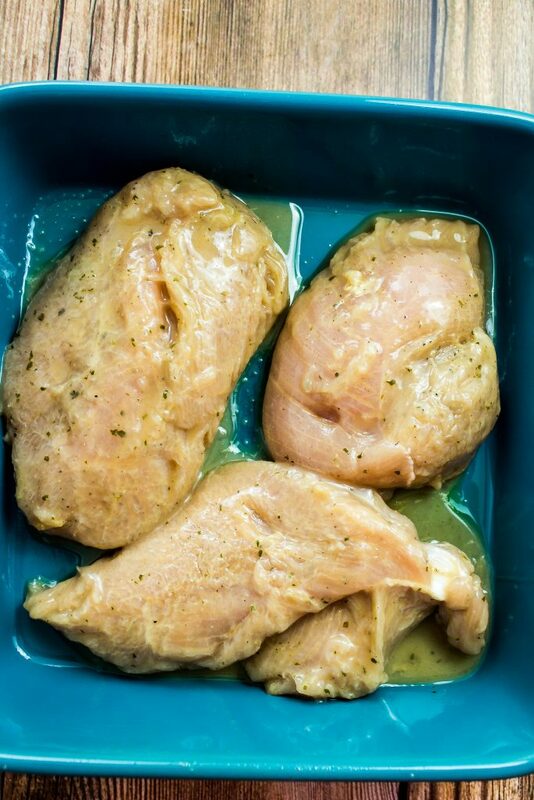 It looks just like chicken breast and is a great swap for any recipe that called for chicken. This casserole has several steps so it’s all about the preparation. To start, roast the turkey breast in the oven at 350 for 55 minutes, the first 30 minutes covered with foil. While the turkey breast is roasting, prepare the potatoes. For this recipe I use baby Yukon gold potatoes. Dice the potatoes into ½ inch cubes and add to a large bowl. To the bowl, add olive oil, salt and pepper. Mix well then add potatoes to a baking sheet lined with parchment paper. Roast at 400 degrees for 30 minutes. While the potatoes are roasting, prepare the other ingredients. Once the turkey breast is cool enough to handle, dice into ½ inch cubes. 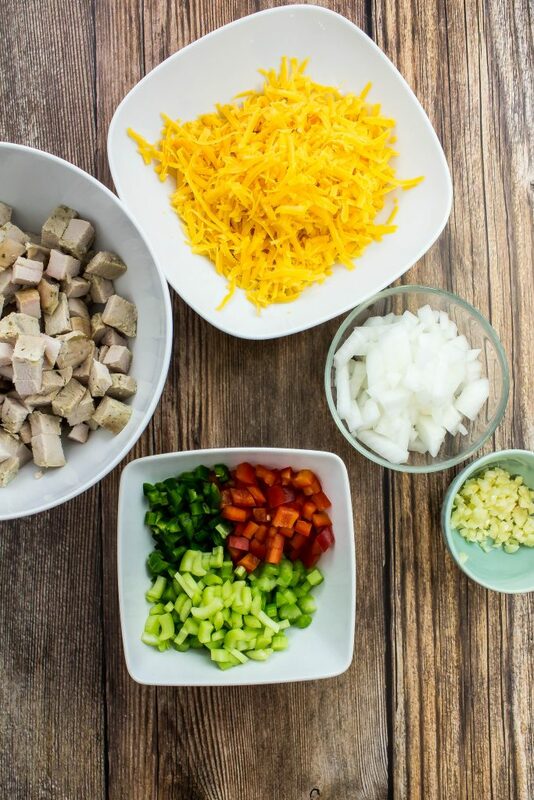 Dice jalapeno, onion, red bell pepper, garlic, and celery, also known as the “holy trinity” in Cajun cooking. Heat a large skillet over medium heat and add oil. Sauté onion, celery, bell pepper, and jalapeno until tender, about 10 minutes. Add garlic and sauté for another minute. Add butter and let melt. Slowly add flour to the veggies and whisk, cooking for a few minutes. Slowly add milk and whisk continuously until mixed. This is the roux base for the cheese sauce! Reduce heat to low and add ½ cup of shredded cheese. 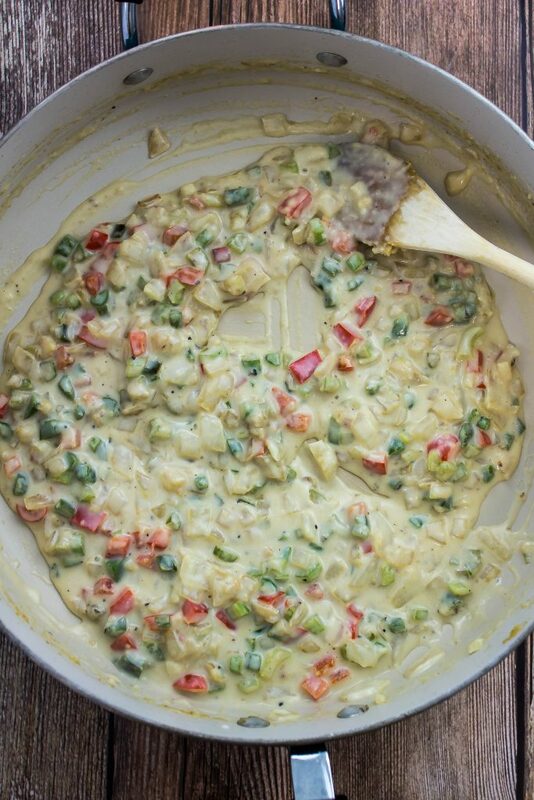 Mix until the cheese has melted, then add another ½ cup cheese and let melt. 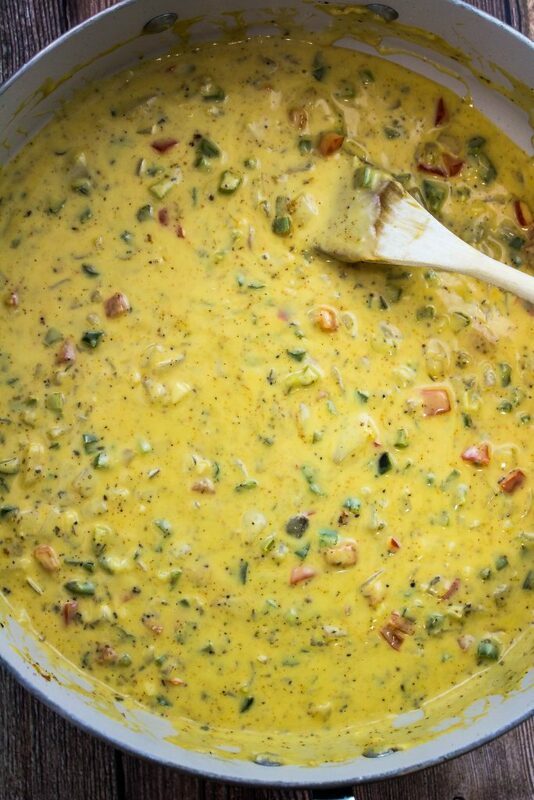 Add another ½ cup cheese plus ½ cup water and mix until cheese has melted. Continue to cook on low until all cheese has melted and sauce has thickened. To the skillet, add the roasted potatoes and diced turkey breast. Mix until well combined. Spray a casserole dish with cooking spray and add turkey mixture to the dish. Spread to an even layer. Sprinkle the top with breadcrumbs and smoked paprika. Bake for 20 minutes. 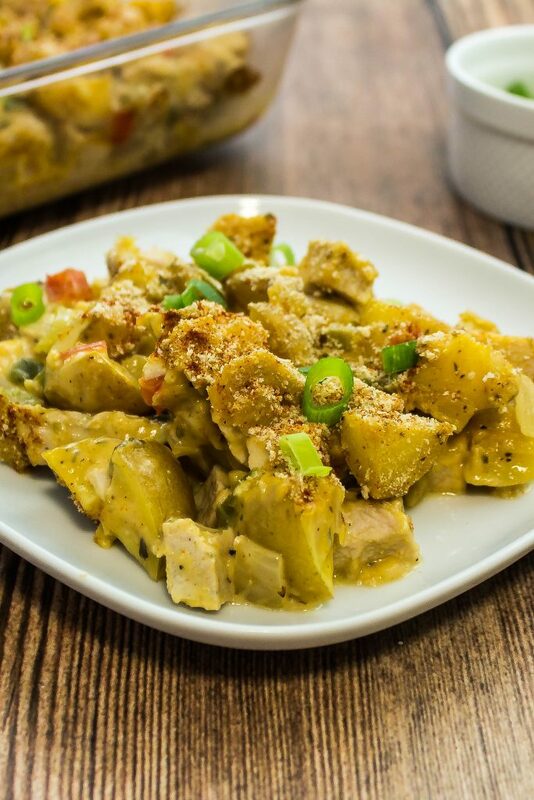 Cajun Turkey Potato Casserole is a delicious blend of roasted potatoes, Cajun spices, and cheese sauce. Roasted turkey breast and baby potatoes mixed with Cajun spices, vegetables, and cheese. Creamy, packed with flavor, and even better as leftovers! Have left over turkey from Thanksgiving? Use it in this recipe! Be sure to save this recipe for later when you need to get rid of that turkey!! 5 Weight Watchers SmartPoints per serving! Remove turkey breast from package and place in casserole dish coated with cooking spray. Remove foil and bake for another 25 minutes. Remove from the oven and let rest. Dice potatoes into ½ inch cubes and add to a large bowl. In the large bowl, add 1 teaspoon olive oil, 1 teaspoon salt, and 1 teaspoon pepper. Mix well. 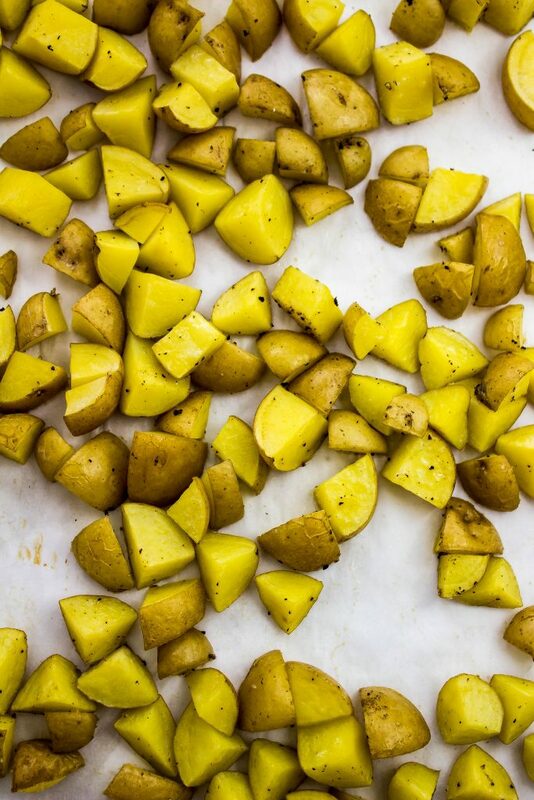 Spread potatoes on a baking sheet lined with parchment paper and roast for 30 minutes. Remove potatoes from oven and keep oven on at 400 degrees. Dice jalapeno, onion, red bell pepper, and celery. Set aside. Once turkey has been roasted and cooled enough to handle, dice and set aside. Heat skillet over medium heat and add 1 teaspoon olive oil. Sauté onion, celery, bell pepper, and jalapeno until tender, about 10 minutes. Reduce heat to low and add butter. Slowly add flour, whisking continuously. Slowly add milk and whisk continuously until there are no chunks. Reduce heat to low and add ½ cup shredded cheese. Let cheese melt then add another ½ cup cheese plus ½ cup of water. Let cheese melt then add remainder cheese and the remainder of water stirring constantly until cheese is melted and sauce begins to form. To the skillet, add potatoes and diced turkey. Mix well until combined. Spread mixture into casserole dish and sprinkle with bread crumbs and paprika. Roast turkey breast on Sunday to save time! Freezer friendly. September 20, 2017 at 11:41 am I would love to try this with my leftover turkey after Thanksgiving instead of soups, sandwiches or salads. 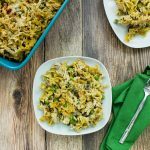 September 20, 2017 at 12:22 pm When I go for turkey I always go for ground turkey, I think I need to start using some turkey breasts, and this recipe looks like an amazingly tasty one to use it!!!! I can't wait to make this next week!!! 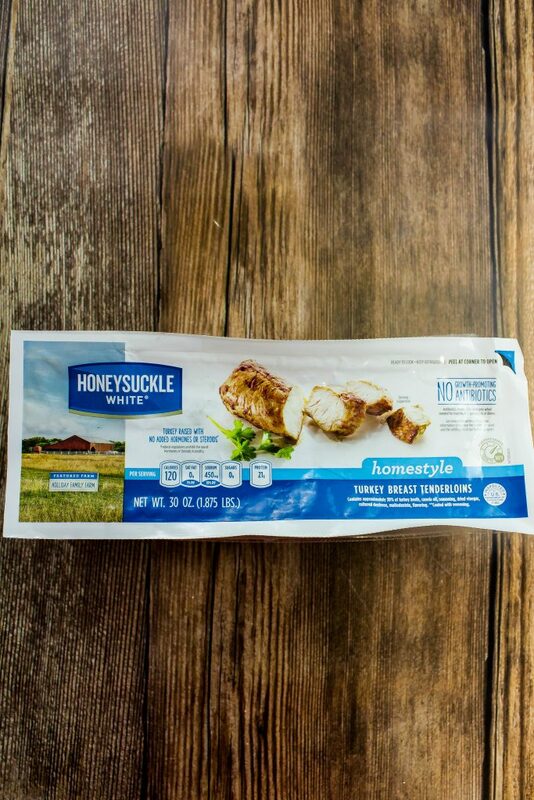 September 21, 2017 at 10:01 am It's super tasty and you should totally look for turkey breast next time! 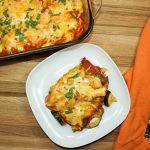 September 20, 2017 at 1:40 pm I'm a huge casserole fan too...especially this time of year! This is a clever recipe and I'm definitely adding this to my menu! September 20, 2017 at 5:29 pm This sounds like an interesting combination and it would be great to have the leftovers for our work lunches now that the weather is cooler here. September 21, 2017 at 10:01 am Yes! The leftovers are even better and definitely make for a great lunch! September 20, 2017 at 8:38 pm I think my husband would love this!! I will definitely have to give it a try. September 21, 2017 at 10:00 am I hope you do try it! 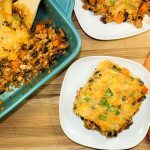 September 20, 2017 at 9:02 pm I love casseroles too. So easy to make and you have plenty of leftovers. September 21, 2017 at 10:00 am I think I like the leftovers better :)! September 21, 2017 at 12:28 pm That looks absolutely delicious! 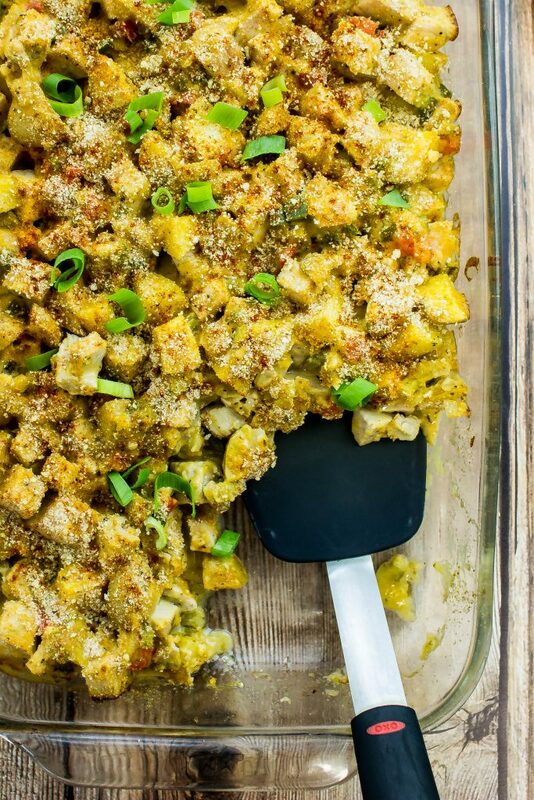 I love casseroles they are just so easy and they make it a breeze to eat a ton of veggies. September 25, 2017 at 6:09 pm I love casseroles too Courtney :)! 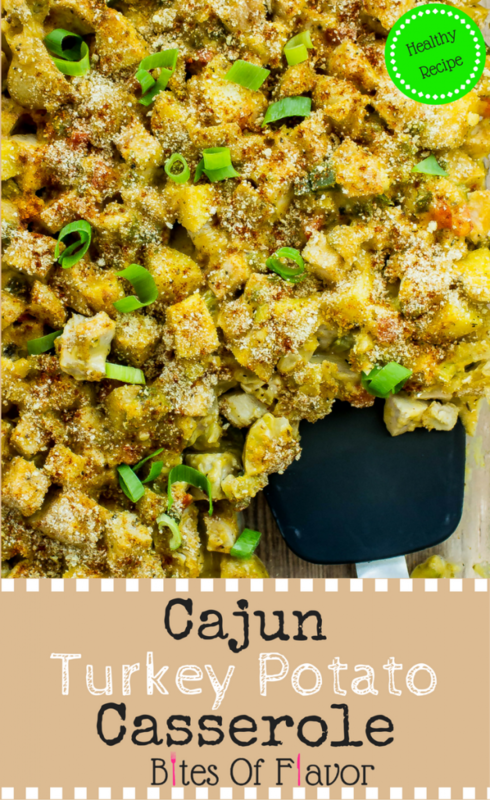 September 24, 2017 at 10:04 pm We lived in Louisiana for a summer and this is making me crave all the cajun food! I'll have to try this! September 25, 2017 at 6:03 pm I crave cajun food all the time... and I love Louisiana!